BABY BACH(TM) is a whimsical, playful music video that will delight and fascinate your child. It introduces little ears to the expressive complex music of J.S. Bach in a baby-friendly way. Music therapy research has shown that listening to classical music can produce positive effects on health and well-being. Lovely images of toys, kinetic art, and real-world objects also offer parents the opportunity to teach words and concepts, while the stimulating music and silly sound effects are certain to captivate and engage infants and toddlers. "Baby Mozart" still triumphs over this one! "Baby Mozart" is a better title, but my daughter's favorite DVD now is "Singing Babies Nursery Rhyme Time." Classical music is fine, but I wanted my girl to know all the classic nursery rhymes that I grew up knowing. "Singing Babies" has gotten her making sounds and clapping. I am very impressed. I don't care for most of the Baby Einstein videos (I have only liked 4 out of 16 that I have watched). Baby Bach happens to be one of the ones I don't like. It's just music with toys and spinning things; like many of the Baby Einstein videos. One toy was pretty neat (a spinning top with blue water inside). Other then that, what really is the point of these videos? I really don't get it. I can just imagine my kid wanting all the toys they see. This video also had some very ugly clown faces in it. Having enjoyed Baby Mozart, we bought this (and Baby Van Gogh) for our baby--but this one was disappointing. The most disturbing thing to me is the role that Julie Clark's two daughters play in this video. They tell silly jokes, smile at the camera, hug each other--it's a little weird, frankly, and has nothing whatsoever to do with Bach. My daughter is 6 months old and she absolutely loves this video! If she is in the middle of crying and as soon as she hears the introduction for the video she stops and turns toward the TV. My 3 year old son will even sit down to watch it. Key words are SIT DOWN. He also sings along and repeats the foreign languages. It's great to have something they can bothwatch. I don't know what it is about the "Baby" series... my little girl (2 years old) just can't get enough of them! And I love them, mainly because if I'm going to have her zone out in front of the tv at all, I'd rather have her learning something in a format that she enjoys. Not to replace Baby Mozart!!! My 8 months old daughter loved Baby Mozart from the moment she watched it (she still does). I decided to add another baby einstein DVD to open up her horizon ... BIG MISTAKE!! I think that this is either a very boring DVD or it is for older kids (maybe over a year old). My daughter is also terrified by the scene with the light show. She looks at it & cries like she is terrified. It is slowly getting better, but I continue using baby Mozart more! So I bought into the baby einstein hype, I bought her the play mat, some toys but had never got a dvd. Frankly I was against the idea of putting my baby infront of the tv until she could at least sit on her own. Well that happened so I decided to get her a DVD. I bought this one but I am SO happy I did not pay this much for it. First off I have to say my daughter likes it. Why she does, I cant understand. Its a low production quality DVD with the most cheap looking "puppets" you can imagine. I really couldnt believe that this is what everyone had been so excited over. These are toys set to classical music. The music isnt even real instruments its synthesized and cheap sounding. I had been playing her classical music since I was pregnant and I love it myself. But this is so cheap sounding. Anyway it really doesnt matter what I think, its not for me. She likes it and is completely enthralled. We also have mozart, neighborhood animals, world animals and van gogh. The van gogh is BY FAR THE BEST out of those I have listed. I like and own other Baby Einstein DVDs. The quality of production is missing in Baby Bach. The segments do not seem themed (as in the other DVDs). In fact it is annoying random as if it was just slapped together. There is too much of a reliance on still shots rather than moving ones that work with the music. It's OK but not as great as the others. I purchased this DVD along with Baby mozart of the Baby Einstein Series, when my son was about 7 or 8 months old and my first though was, "oh my God, how weird!" but then i saw my son paying attention to the video, and smiling sometimes, so i gave it a try, he likes this video a lot, but he likes others much more, like Baby Mc Donnald, Numbers Nursery, Language Nursery, Shakespeare, etc and that is only from the Baby Einstein series, there are so many more educational videos, that will teach your child new things, that is true they will eventually learn without the videos, but the videos will make it faster, I am not a teacher, I am just a mom that wants the best for her 14 month old baby boy. My son doesn't like that DVD at all. When he was around 3 months old I bought 3 DVDs: Bach, Beethoven, & Mozart. He loves Beethoven & Mozart, but starts to cry whenever he seas and hears Bach. I love Bach myself and was confused of my child's behavior. I decided to wait and see if he will like it later on. Does'nt live up to the hype. Another fantastic Baby Einstein! You can't beat the music! So is this how Bach meant the music to be played? When our son was a baby he had many health problems. These problems, and the medications used to treat them, caused him to be very irritable. I bought this video on a whim and when I put it in the VCR an amazing thing happened...he calmed right down. After that, all we ever had to do when he was uncomfortable was to pop in this video. My daughter (12 months old) is a big fan of Baby Mozart and Baby Beethoven, so I went out and bought Baby Bach and Baby Neptune. 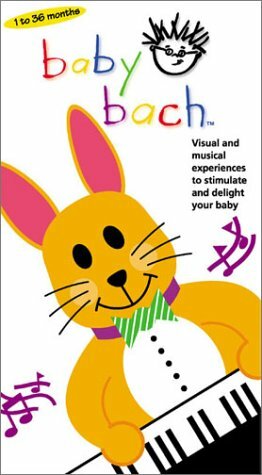 I was very disappointed by Baby Bach even though it seems to entertain my daughter for about 10-15 minutes. The excessive display of the children is annoying and seems to be the reason my daughter gets bored with the video. Baby Neptune is cute and I like it, but my daughter won't have anything to do with it. I'm hoping that the other Baby Einstein videos are better because I just bought Baby Van Gogh and Baby Neighborhood Animals for her 1st birthday. Is Bach "enchanting"? Prelude to "Kenny G Plays Bach." I haven't seen "Baby Mozart" and decided to preview this one before giving it to my granddaughter. If this one deserves the criticism of some other reviewers, the Mozart video must indeed be terrific. The arresting images made me think I was watching in HD/Blue Ray yet, despite the visual enhancement, they're all familiar objects, toys, and child faces that should grab the little spectator's attention. The music, too, is "enhanced," and therein lies a potential problem. Why must all of Bach's music--piano, organ, orchestral, choral--be played on a soft and echoey synthesizer? It's all quite enchanting, but how often is Bach, of all composers, ever described as "enchanting"? I purchased Vol. 1 which is a series of 6 Baby Einstein DVDs (Bach, Mozart, Beethoven, Neptune, World Animals, Neighborhood Animals)for my baby when she was a newborn. She is now 17 months old, and she has never cared for any of them EXCEPT for the Neighborhood Animals DVD which depicts scenes of familiar animals like cows, horses, cats, dogs, etc. She really loves the part when they sing "Old MacDonald". The other titles, including Baby Bach, are downright boring. I think overall the Baby Einstein series is over-rated. I could put on a better puppet show myself using the toys in my living room. I think a lot of folks, including myself, were intrigued by the catchy "Baby Einstein" name, because we all want to raise little Einsteins. I'm sure the folks at Baby Einstein are laughing all the way to the bank! I haven't seen some of the other titles like Van Gogh, Numbers Nursery, Shakespeare, etc., so I don't know if these are any better, but with all the money i'm out on Vol.1, I won't be giving Baby Einstein another chance. We much prefer the Brainy Baby and Baby's First Impressions (predecessor of the Brainy Baby series) series of products. But, to each his own. I bought this disc along with the whole Baby Einetein series for my 6 month old, and he still watches it at 2 years. This follows in the tradition of most of the Baby Einstein discs as it is great for kids' skills. Parents will enjoy teaching their kids with these discs. Also the discs offer just the music separately. Don't Get This Baby Einstein. There are better! My children can't get enough of these! I bought Baby Einstein's Neighborhood Animals for my now 10 month old. She has enjoyed that DVD since she was about 7 months old and never grows tired of it. She cannot take her eyes off the TV when it's on and squeals everytime a new animal comes on. After that one was such a hit, we bought Baby Bach...it's okay, but not nearly the DVD that Neighborhood Animals is. My baby's interest in Baby Bach is nothing compared to the other. The objects used are just not as captivating and seem a little dull after the first couple of segments. My husband and I agree that it's pretty boring compared to what we got used to. Some babies may enjoy it, but this is the result at our house. Baby Galileo is a GREAT one too.